We had a wonderful Annual Party and Fundraiser at Starting Block on Saturday evening. It’s fun to see some of the members of the Facebook group in person and be able to talk to them directly about what we are doing. We want the thank Starting Block and American Family--the owners of the building--for allowing us to use their beautiful new space. Also thanks to everyone who came. You make Madison Bikes what it is. If you missed the party--or even if you didn’t and still want more Madison Bikes fun-- mark your calendars for the Winter Bike Fashion Show at the High Noon on Saturday afternoon, November 17. You’ll hear more about it, but here’s the link to the Facebook event. Also last week was the Bike Fitchburg Pick Me Up At The Border, which started at the Capitol at 7:00 pm and rode all the way down to the Illinois State Line, and back, on the Badger Trail. Looks like they are doing it again, but this time during the day, on October 7. The Madison Bikes Communications Committee will meet in the Stiftskeller at Memorial Union at 5:30 pm. If you would like to write blog posts, help us get the weekly update out, or otherwise work on communications for us, drop by and say hello. Important things first: It's the week of our Madison Bikes Party and Fundraiser! There will be food, there will be a photo booth, there will be beer -- and most importantly: There will be lots of awesome people who care about biking in Madison! Please support us and get your tickets in advance! You can also just show up on the day of the event, but having your ticket in advance will make things go more smoothly. Big thanks to our sponsors American Family Insurance, Starting Block Madison, Jonny Hunter of Underground Food Collective fame, and Rockhound Brewing. Also a reminder that you can join the Madison Bikes Board of Directors. The party on Saturday will be a great opportunity to meet current board members and ask questions. More details here. El Tour de la Familia Latina celebrated their first birthday. Big shout out to the BiciClub Latino de Madison for putting together these rides! While the weather was great for the celebration, the ride was overshadowed by news that several immigrants had been detained in the Madison area by Immigration and Customs Enforcement. If you live in or ride through Monona, consider taking action on a stretch of bike path that would close a gap between the Cap City Trail and an already existing path along South Towne Drive. Madison Bike community member Bruce has written a draft email to Monona city officials that you can use. The meeting about the path is tonight at 6pm already, so please act quick. Tonight, Monday, Bike Fitchburg has their monthly meeting. I imagine they may be celebrating the opening of the newly built shoulders on a stretch of Whalen Road -- something the organization had been fighting for hard. 6:30pm at the Fitchburg Public Library. There should be a livestream of the meeting, or you can subscribe to an audio podcast version here. On Thursday, come to the Cargo Bike Shop for their workshop on the "Art of Bicycle Commuting." Or, since this workshop is primarily aimed at people new to commuting by bike, send your friends who are interested in bike commuting but haven't made the jump just yet. Yours truly and our board member Michael will both give brief presentations. Thursday, 6:30pm. One bike advocacy fundraiser is good. Two is even better. Join Bike Fitchburg for their Pick Me Up at the Border Ride. It's an annual event where you meet at the Capitol in Madison and ride all the way to the Illinois border (or however far you'd like to ride) on the Badger State Trail. Meet Friday at 7pm on the Capitol Square. $15 suggested donation. Remember, if you have an event that you'd like us to include on the Community Calendar, send it to us. Want to become more involved in local bicycle advocacy? Consider joining the Madison Bikes board of directors. Madison Bikes is looking for people who are dedicated, passionate, strong communicators, good compromisers, organized, and able to commit time and energy to promoting biking as a priority in the city of Madison. There are no paid staff and everything we do—from fundraising to advocacy to communications to events—is done by our volunteer board and volunteer committee members. We are currently accepting applications for up to seven seats on the Madison Bikes Board of Directors, with elections taking place in December. Our organization is committed to the goal of building a culturally diverse and pluralistic board committed to equity in our work. We strongly encourage applications from people of color, women, and other groups who are underrepresented in bike advocacy. Have passion for our organization’s vision: Making Madison a city where anyone can ride a bicycle conveniently and comfortably to any place in the city and neighboring communities year round. If you are interested in joining our board, please complete this application form by October 4. If you would like to nominate someone other than yourself, please forward this post/email to them and ask them to apply. A great opportunity to informally chat with current board members will be our party and fundraiser on September 29. Our executive board will review all application submissions and follow up with all applicants with next steps. Still have questions? Email Kate! Bye Bye Bucky, It is almost party time! Bucky on Parade wraps up this Wednesday. If you haven’t gotten to see all of the Bucky statues yet, it's time to plan out your route, and make it happen. Or perhaps you have a favorite Bucky you pass on your commute every day, make sure to grab a picture of your bike in front of Bucky before they are gone. The statues will be auctioned off later this month, and hopefully some will become permanent fixtures around the city. Our annual party is almost here. It will be Saturday, September 29th from 4 to 7 pm. We will be in a new space this year, and the events team has a lot of cool stuff in store for you. We are asking that you please buy your tickets in advance. You can find out more information and a link to buy tickets here. Madison Bike Events Committee will be meeting at Bariques on Park Street tonight at 6 pm. They will be handling final preparations for the annual party. It is not too late to get involved to help make the party a great success. Tour de Latina Familia - More info will be available later this week. Back Lot Bike Swap - Hosted by The Cargo Bike Shop. Buy, sell, or trade bike stuff, drink coffee, test ride cargo bikes, hang out. It'll be a good time. Admission is free. They will also be collecting donations for the WilMar Neighborhood Food Bank, so bring along some non-perishable food items to help them out. Every donation gets a raffle ticket. The more you bring, the more tickets you get! Bike the Barns - A day of biking, farm tours and live music - all fueled by gourmet, local meals! This year's route will be in the gorgeous Driftless area, starting and ending at Nishan Park in Reedsburg, Wisconsin. We're biking to make healthy food accessible for all; every dollar raised by Fundraiser Riders supports our Partner Shares program. The ride includes a short (26 miles) or long ride (56-61 miles) option. They will visit Wormfarm Institute, Orange Cat Community Farm, Jumping Jersey Dairy and Meadowlark Community Farm (Long Route Only). Perks include a gourmet lunch, event After Party, commemorative water bottle, and fundraising prizes! Visit csacoalition.org/bike-the-barns for more details and to register! Floods. New residents. Oh my! This time of year is always a little dicey for people on bikes. Lots of new people have just moved to town, parents are moving their kids into apartments, people are trying biking in a real city for the first time, and they are all confused by one-way streets and how we get around in Madison. Lots of the people driving have never seen bicyclists actual using the street, or they don't expect paths to be so crowded. The only thing anyone has taught the freshmen about biking is, "Stay of the way of cars." Everyone is a little on edge. Now throw in flooded streets that redirect everyone to a few corridors on the east side, and it gets worse. My very-experienced and strong colleague, who commutes eight miles each way through the east side, told me that they worst part of his Madison Flood 2018 commute is that drivers are racing through the yellow (or red) light because they are so backed up and late. Just take a breath, enjoy the ride, and be patient with all the confused newbies. Be happy that you are probably going the same speed as you normally do, and you can navigate around most of the flooding via side streets, sidewalks, and use of fenders. And we should all give a big thanks to city staff for sandbagging the area around the Monona Terrace path so we could still use it. Not every city would care enough to do that. Everyone has probably seen this already, but just in case you've been away and wonder what's open and closed, you can find maps of conditions--including a crowd-sourced map of bike path closures--on the city's website. The Madison Bikes Communications Committee will meet at Memorial Union at 5:30 pm. If the weather is nice, we be just outside the beer window of the Stiftskeller. If it's raining, we'll be inside the Stiftskeller. If you have enjoyed these updates and our Facebook group, consider joining us to talk about how we communicate with our members and friends. We now have over 1500 subscribers to the Facebook group! Also on Tuesday, the Mayor will release his Capital Budget at the Council meeting, which will then go through all sorts of committees and hearing before being passed in October. There's no link to the budget right now, but the capital budget is for financing large projects--things that are financed to pay off. This is where things like roads, paths, buildings, big equipment, construction, and other large projects are seen. 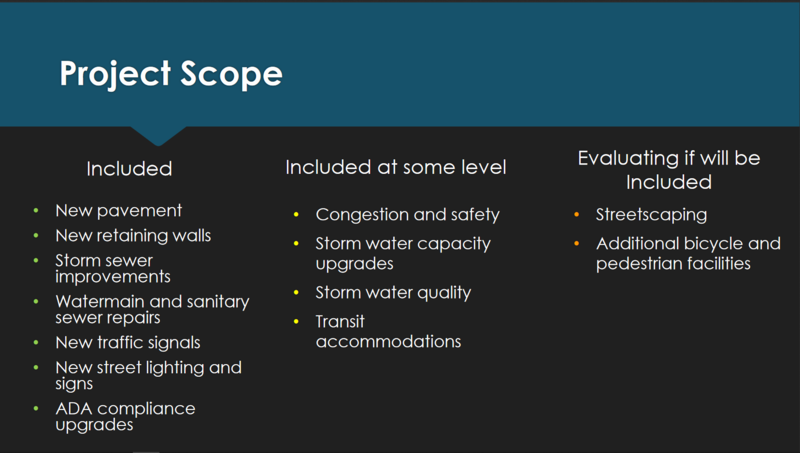 Keep an eye on this to see what the city's priorities are for transportation. Nothing else major on the Council agenda, but in case you're interested, you can see the whole thing online. The new Transportation Commission meeting has been cancelled, but the Madison Area Transportation Planning Board (the MPO) will meet at 6:30 pm at the City-County Building, 210 Martin Luther King Jr. Blvd, Room 357. 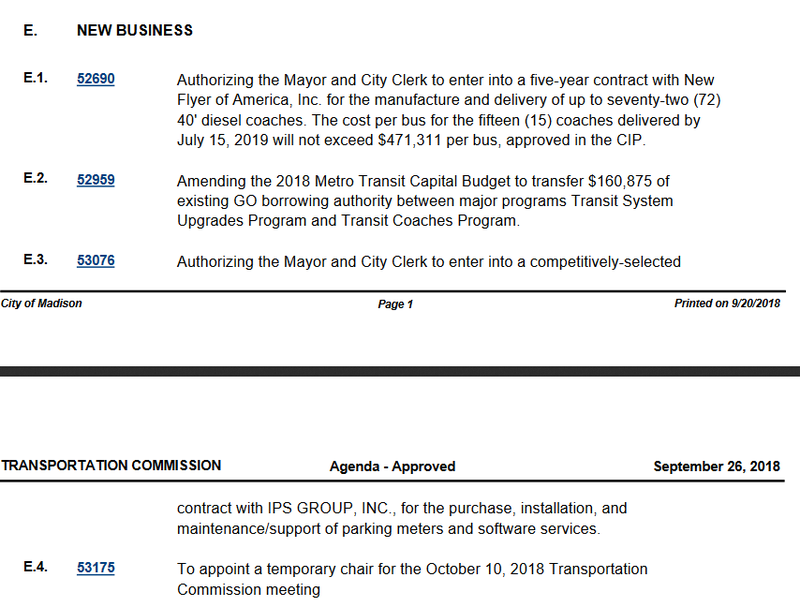 The MPO, which is the body that plans and allocates federal money for all the transportation projects in the entire metropolitan area--not just the city-- has been switching off its meetings between downtown and the Water Utility building on Olin Ave, so best to check their calendar to see where they are meeting. For this meeting, they will be holding a public hearing on the Transportation Improvement Program (TIP) for 2019-2023. That means they will be voting on what they plan to find for the next five years. This is revised every year, but gives you an idea what they are planning on doing. Want to see what's in there? Here's a link. The September MadTown Unity Ride will leave from the Villager Mall at 10 am. 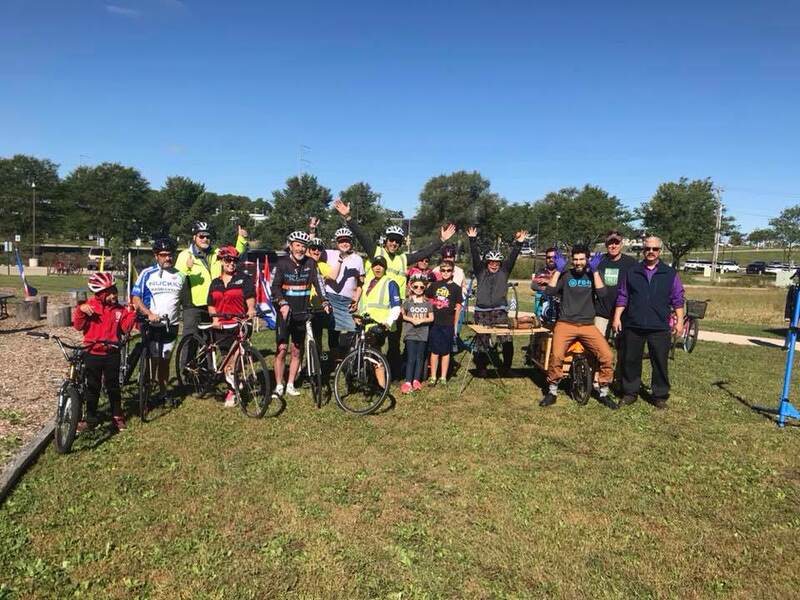 MadTown Unity Rides are organized by local groups to celebrate the unity and diversity of Madison Southside and to connect our communities together. More information can be found on their Facebook event linked above. 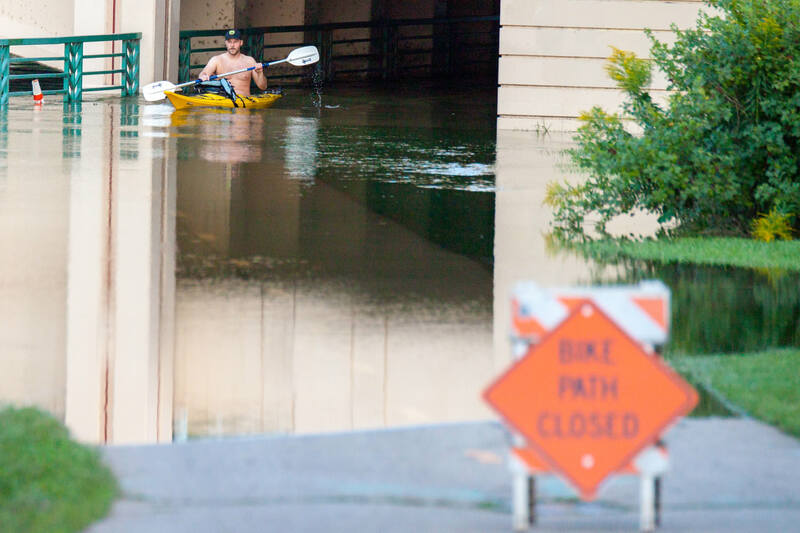 The flooding in Madison and Dane County is probably still on everybody's mind. Our Facebook group saw over 100 new members in the days after the initial rains. 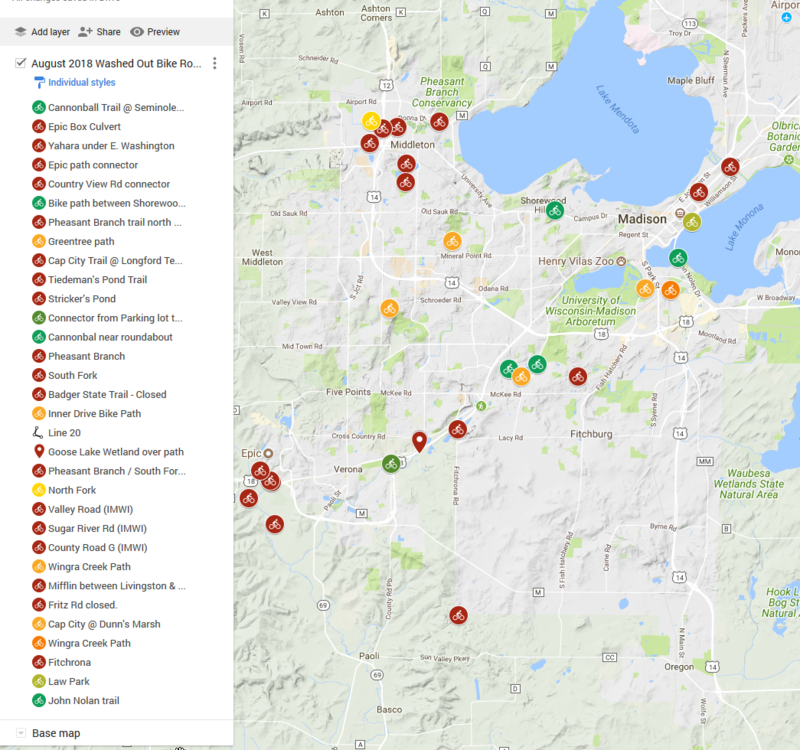 A crowdsourced map of bike path closures, created by Madison Bikes supporter Paul Wilson, has been viewed over 30,000 times. Please continue updating the map -- the city told us that it has been very helpful. And you can sign up to volunteer to help with sandbagging. Many of the regions mountain bike trail systems were damaged by the rains as well, especially Blackhawk and Pleasant View. Capital Offroad Pathfinders has more details and is always looking for volunteers to help with trail repairs and maintenance. 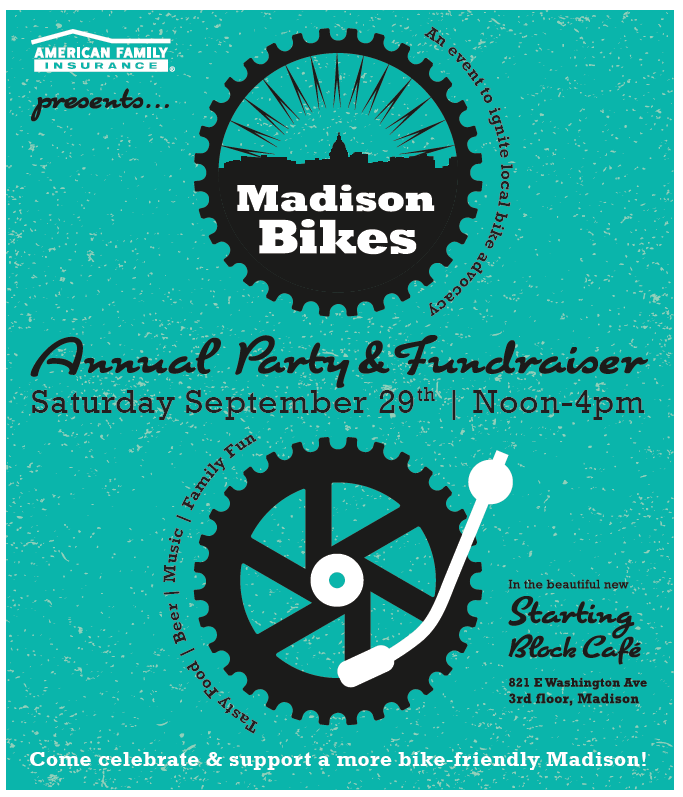 Our big party to celebrate biking in Madison is coming! Save the date: September 29, noon! Thanks to our great location sponsors Starting Block Madison and American Family Insurance, the party will be in the beautiful new Spark building on East Washington Ave. Ticket sales will go live shortly, and we'll have more details for you. Kudos for the great flier to our new volunteer Natalie! However, based on a report from a Bike Fitchburg member who attended the meeting, there was some discussion "complet[ing] the multi-use path along the west side of Fish Hatch to the Beltline Bridge and create a bike/ped under road crossing at the Nine Springs water way. Better lane designations were recommended specifically near the Green Way Crossing intersection with regard to cyclist riding north of Fish Hatchery and the automobiles gaining access to GWC or the eastbound beltline." Bike Fitchburg will probably discuss the project at their monthly meeting, tonight at 7pm at the Fitchburg Public Library. The highlight of Bombay Bicycle Club's ride calendar each year is their Wright Stuff Century. You can ride between 32 and 125 miles in the hills west of Madison. More details and registration here. In the aftermath of the flooding in Dane County, Madison Bikes supporter Paul Wilson has create a Google Map where everyone can add reports about flooded or washed out bike paths. We were just contacted by the city, and they're asking people to contribute to this map (instead of using the Report-a-Problem website). There's still a lot of water going downstream, and so flooding will continue to be an issue. If you have issues adding to the map, you can still use the Report-a-Problem form. Please respect bike path closures, and be safe out there! And thanks to Paul and the community for providing up-to-date information on biking conditions.